Sale Price (if applicable) does NOT include freight $595, Dealer Document Fee $99, Tax 7% (Indiana Residents), Indiana Title Fee $25. Sale Price INCLUDES all factory incentives. 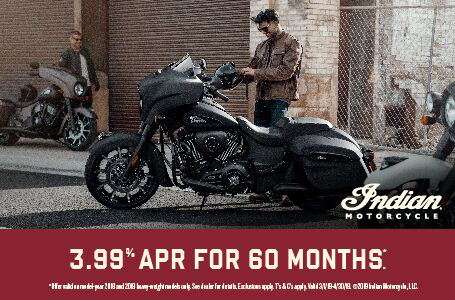 Online sales prohibited by Indian Motorcycle Company, all sales must take place at the Authorized Dealers premise. Quick Release Saddlebags: These genuine leather saddlebags offer both style and convenience. They hold plenty of cargo for you and your passenger. Plus, they feature Quick Release technology, so you can attach or remove them in under a minute with no tools required. Classic Whitewall Tires and Wire Wheels: The mark of a classic Indian Motorcycle® design: whitewall tires on wire wheels. Driving Lights: With standard front driving lights, the Chief Vintage illuminates the road for safe riding, day or night. Quick Release Windshield: This stylish windshield provides outstanding wind and weather protection to make every ride more comfortable. With Quick Release technology, it can be installed or removed in less than a minute with no tools. 119 ft-lbs of Torque: The Thunder Stroke® 111 produces 119 ft-lbs of torque with extraordinary power at low RPM, so you can accelerate effortlessly with power to spare in every gear. Chrome Hand Controls: Chrome never goes out of style, and you’ll find plenty of it from end to end on the Chief Vintage. Premium Genuine Leather Seats: Comfortable seats feature premium grade leather designed to withstand the elements and retain its natural beauty. They add to the beautiful style while delivering all-day riding comfort. 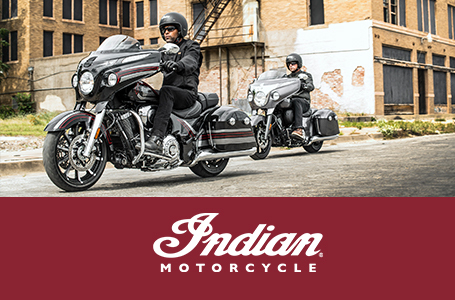 Indian Motorcycle® Badging: The logos on this bike are powerful, stylish and iconic. No other brand has such legendary identification. For over 115 years, Indian Motorcycle® has stood for the ultimate in style, performance and power. Wheels/Front: Spoked 16 in. x 3.5 in. Wheels/Rear: Spoked 16 in. x 5 in.